Under the present scenario of increasing and diversifying business globalization, drastic changes have been taking place in almost all the business sectors, even in political circles, small or big that require total safety and security to the human beings, properties, valuables etc. to enable to protect them from the unsocial elements. The terrorists and underworld activities are also on the rampage and creating fear in the minds of people at large. Employment problem due to industrial unrest and chaos among the jobless workmen are also creating problems threatening damage to the properties and the top brass management and executives. Even there is a risk from opposition and competitive business tactics as far as business is concerned. As the Government has its own limitations in providing police protection to control and curb such elements, the present environment, therefore, calls for private security forces for providing specialized types of safety and security cover. We are in the security profession since 1967 providing Detection, Safety & Security Services for the last 47 years with distinguished business track record. Presently, business is being managed and carried out by “M/S. CD SAFETY & SECURITY SERVICES PVT. LTD”. a registered company incorporated under “The Companies Act, 1956”. 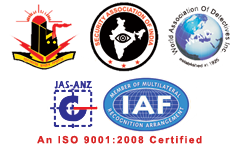 The Central Government introduced PSAR Act 2005 (The Private Security Agencies Regulation)Act 2005 under which we have been issued License No 1/2007 for the State of Maharashtra to run the business of Private Security Agency by the Commissioner of Police, Navi Mumbai, the controlling authority and further renewed till 31 March 2017. Similarly we have PSARA License issued by the controlling authorities for Karnataka, Gujarat States. The Company is professionally managed and controlled by Shri. Gurcharan Singh Chauhan as Managing Director – under whose able leadership and proven guidance, we are on the fast progressive track in the business of providing detection, safety and security services to one and all. Respected Shri. Gurcharan Singh ji is ably supported by highly competent command at all levels with professionals having long experience in the field of security, intelligence, vigilance, personnel management and administrative field. We have our command structure consisting of Executive Directors, General Managers and Branch Managers. Our set up mainly consists of ex-servicemen from the ranks of Sepoy to Colonels who are the veterans of 1962, 1965 and 1971 wars. We provide our services in any part of the Country. We have our business network spread over in major cities of India. We are presently controlling all business activities from our branches. We believe in running our business of providing safety and security services on the highest moral values, business ethics and human considerations. We provide trained manpower and specialized services in the field of detection, safety and security to all – Private and Public Sectors, Offices, Industrial Units, Shopping Malls, Hospitals, Schools, Banks and Hotels etc.